Watch Tokyo Police Club's 8-bit video game-filled visual for "Hot Tonight"
Happy Tokyo Police Club release day! The band's fourth album "Forcefield" is out now. Tokyo Police Club announce new album "Forcefield", stream "Hot Tonight"
The album is available to pre-order now, ahead of its March 25 release date. It's been pretty quiet on the Tokyo Police Club front since the release of their 2010 record "Champ", and we couldn't be more stoked that they're back. Tokyo Police Club Perform "End of a Spark"
Watch Tokyo Police Club perform "End of a Spark" for the Kiyanna Project at the Backstage Bar, just behind La Zona Rosa. Tokyo Police Club is happy to announce that they'll be heading home for a full tour of Canada in March and April. Tickets are available to fans through our special presale going on right now! Make sure you check out the VIP package, which includes a Tokyo Police Club poster, signed copy of "Champ" and early entry into the venue. For dates and details, click here. Also, don't forget to arrive early and help color in their new tour posters! They'll add each new poster to our facebook page so you can tag your work! Download the images and submit your own designs on facebook for a chance to win a signed, one-of-a-kind Tokyo Police Club poster from a live show! Both Tokyo Police Club and Freelance Whales have recorded new Daytrotter sessions that are available now. 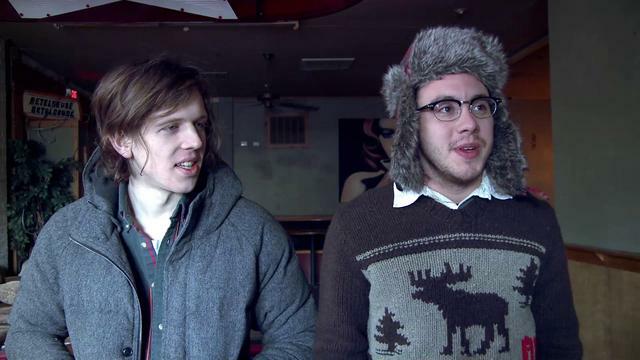 This marks the second appearance for each band -- Tokyo Police Club first stopped by the Horseshack in 2007, while Freelance Whales recorded their debut session this past spring. Check out Tokyo Police Club's session, which includes 'Favourite Colour,' 'End of a Spark,' 'Boots of Danger (Wait Up)' and the unreleased track 'Top Five' here. Love Freelance Whales? Listen to the band's live renditions of 'The Great Estates,' 'Broken Horse,' 'Location' and 'Ghosting' here. Check out this amazing video of Tokyo Police Club guitarist Josh Hook teaching fans how to play 'Frankenstein' from the band's new album, 'Champ.' The video is part of Q's 'How To' video series. Watch and learn! Tokyo Police Club's "Breakneck Speed"
Stream the new song from their upcoming album below, and share it with your friends! Tokyo Police Club revealed a song from their upcoming album Champ on Stereogum today. Check out "Breakneck Speed" HERE!